After her husband dies in a tragic accident, a woman and her son move into her sister's house that is for sale until they can get back on their feet, though unexplained events interfere with their recovery. Have you ever finished watching a movie and felt like it was a complete waste of time and energy? That's the feeling we got after watching Netflix's recently released horror film "The Open House." This film is written and directed by Matt Angel and Suzanne Coote, neither of whom have much experience writing or directing. The film stars Piercy Dalton as Naomi Wallace and Dylan Minnette as her son Logan. When Naomi sends her husband Brian, played by Aaron Abrams, to the store for some eggs and milk, he is struck by a runaway car, killing him instantly while his son was there to witness it. Naomi wasn't left in the best financial situation and is now struggling to pay their bills. She puts her house up for rent while she and Logan go stay in her sister's home, which is up for sale. They get to stay at the house rent-free but have to deal with the occasional open house so prospective buyers can check it out. A short time after moving in, bizarre, unexplained occurrences start to happen. The slow-burning horror-thriller genre has made a huge resurgence in the past few years. It's a genre that relies on mood, atmosphere, and tension rather than gore, disturbing visuals, and jump-scares. We love good slow-burn horrors, including movies like "Rosemary's Baby," "The Shining," "The Babadook," and "TheVVitch." The key to any successful movie like this is that it builds to something. These types of films keep the audience tense and on-edge, leading to a satisfying grand finale. 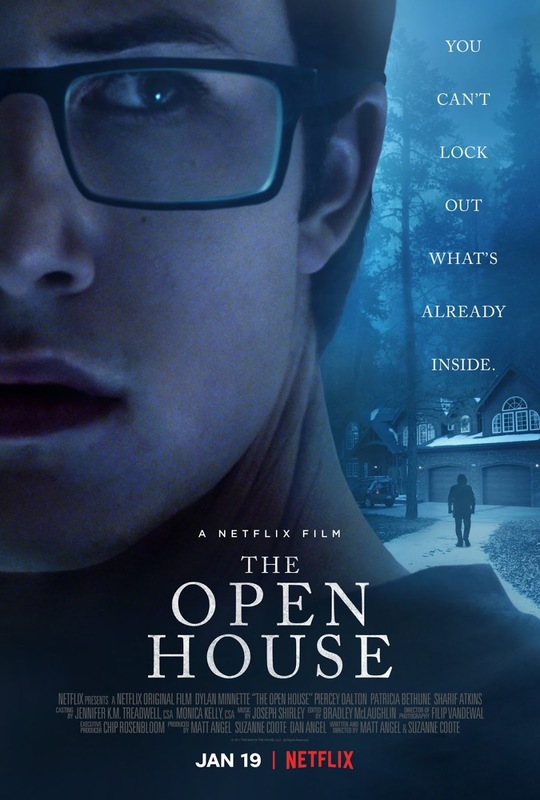 "The Open House," on the other hand, takes the opposite approach and fails to build tension, fails to set a creepy mood or atmosphere, and worst of all, it fails to pay off in the end. Sure, it has a "big climax," but we don't care when it happens because where the filmmakers take the story is stupid. We are 110% unsatisfied with the final outcome. Writers Matt Angel and Suzanne Coote act like they are trying set up all of these intricate threads and introduce all of these different characters, but none of it is important to the overall story. They want us to ask questions like, "is this a ghost story? Is the neighbor a psychopath? Is the friendly guy hitting on Naomi a stalker? Is Logan just going mad because of witnessing his father's death?" All of these would have made completely legitimate endings. But, when the end actually happens, it feels like the filmmakers stuck a big ol' massive middle finger our faces and told us to go f*ck ourselves as they deliver the stupidest, laziest cop-out of an ending we have seen in quite some time. And, in the process, they answer no questions whatsoever. Ambiguous endings are fine with us when the lack of total answers lends itself to the overall story. Endings like that feel satisfying because the exact answer doesn't matter. The conclusion of "The Open House" doesn't feel like it left questions unanswered because those questions never mattered. It simply felt like they left them unanswered because the writers didn't know what they were doing and had no clue what they wanted to say. It's like they felt like they had to slap something on the end of their already dull drudgery of a movie and they didn't know what to do, so this is what we got! Lucky us! It's clear that Angel and Coote have a lot to learn, and we hope for the sake of their careers they learn their lesson fast. We know "The Open House" is free to watch on Netflix, but please spare yourself the torture and don't watch this boring, pointless movie. We don't do this often because we like knowing people explore films for themselves and make their own decisions regardless of what critics have to say, but in this instance, we implore you: DON'T WASTE YOUR TIME on this non-horror horror movie. You will not get it back.